In this article, learn about Ripple carry adder by learning the circuit. A ripple carry adder is an important digital electronics concept, essential in designing digital circuits. Multiple full adder circuits can be cascaded in parallel to add an N-bit number. For an N- bitÂ parallelÂ adder, there must be N number of full adder circuits. A ripple carry adder is a logic circuit in which the carry-out of each full adder is the carry in of the succeeding next most significant full adder. It is called a ripple carry adder because each carry bit gets rippled into the next Â stage. In a ripple carry adder the sum and carry out bits of any half adder stage is not valid until the carry in of that stage occurs.Propagation delays inside the logic circuitry is the reason behind this. Propagation delay is time elapsed between the application of an input and occurance of the corresponding output. Consider a NOT gate, When the input is “0” the output will be “1” and vice versa. The time taken for the NOT gate’s output to become “0” after the application of logic “1” to the NOT gate’s input is the propagation delay here. Similarly the carry propagation delay is the time elapsed between the application of the carry in signal and the occurance of the carry out (Cout) signal. Circuit diagram of a 4-bit ripple carry adder is shown below. There is a simple trick to find results of a full adder. Consider the second last row of the truth table, here the operands are 1, 1, 0 ie Â (A, B, Cin).Â Add them together ie 1+1+0 = 10 . In binary system, Â the number order is 0, 1, 10, 11……. and so the result of 1+1+0 is 10 just like we get 1+1+0 =2 in decimal system. 2 in the decimal system corresponds to 10 in the binary system.Â SwappingÂ the result “10” will give S=0 and Cout = 1 and the second last row is justified. This can be applied to any row in the table. 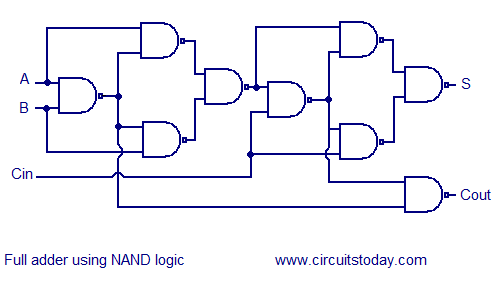 Full adder using NAND or NOR logic. 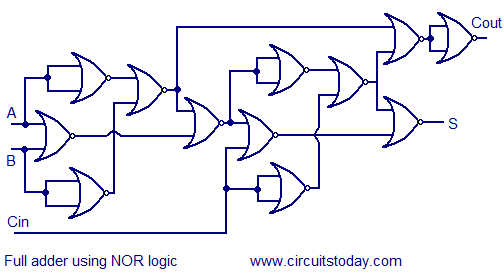 Alternatively the full adder can be made using NAND or NOR logic. These schemes are universally accepted and their circuit diagrams are shown below. what actully a ripple carry addder is…? How to 8 bit encryption logic gates. 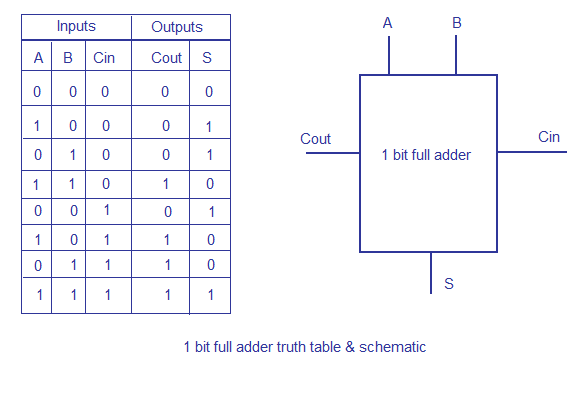 I believe the full adder truth table image file is wrong in the last row. Should not Cout and S both be TRUE when inputs A,B, Cin are all TRUE? please go through some standard book like marris mano.